Uh oh! You need to get some peacock feathers. They come in sets of 12 so they'll be some for everybuddy. Surely W2 can't steal all 12. My weekend sucked. The peeps were out all day yesterday. No feathers, rockets or blog post for me. Poor Katie. I'm sure Glogirly will get you another. Oh Katie is practicing her Halloween cat pose or as we call it in yoga "the cat". didja make it ded? we allus do! I hope Waffles didn't irreparably kill your feathers, Katie! oh dear! That's us too. We gotted a new toy with three feathers on it and they is all gone now. Care of the Ornj Mutant. THIS is why we can't haz nice things! It's a sad life you lead, Katie!! A weekend packed with jam sounds interesting. Was it raspberry? Glogirly will get you another feather! Poor Katie, Waffles doesn't understand boundaries ... but then we don't do much better! MOL! Shame, that does look like it was a nice feather. We love fev-vers too. Mom had a gift package for a friend's new adopterated kitty and she had to put it in Dad's car so we wouldn't dead it before the new kitty got it. We bet Waffles steals everything from you, doesn't he, Katie? Awww, we are sure you'll get another one, Katie. uh oh.....we hate it when those feather toys die. Maybe Glogirly can buy a bunch for both of you. Why do I have a feeling your feather toy only has stumpy tips now? Oh dear a "no" feather! Katie you deserve lots of pretty feathers!!! Uh, did you kill the feather?!? Glad you had a great weekend! Uh oh. 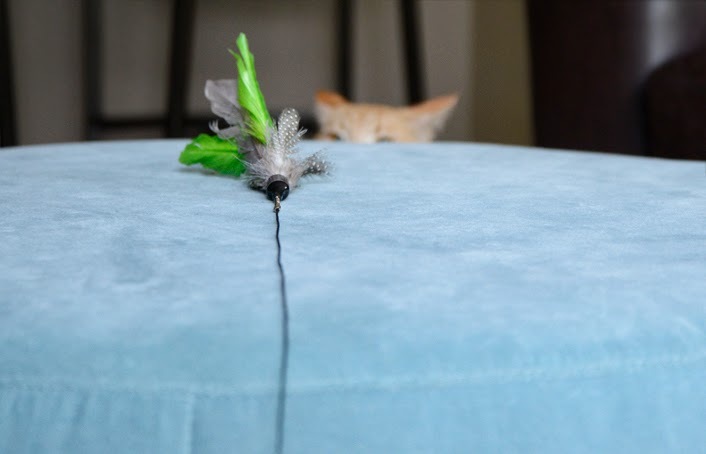 I think that orange cat-shark is going to get that feather! *GASP! * Did the Orange One take your feather?!?! Oh, that's just horrid!!! Do you want me to come over and stare at him?!!? Feather toys are fun! Even for my doggies. :) Even though Waffles is blurry in the background of that one photo, he's so cute! I can just imagine that one second later he practically flew up on that table. What a cutie! Well, they are fun, with or without the bird attached! Waffles is so sneaky. LOL. Ah, yes...we get it. The same reason all our mousies don't have ears or tails anymore. The orange boy syndrome. Happy naps! uh oh. The dreaded Ottoman Shark! The table shark got a hold of it! Why did the Jaws music suddenly come into my head when I saw the last photo? Yeah, we used to have lots of feathers, too....until Misty destroyed most of them! Phew...rough weekend! We hopes you is getting lots of rest this week to make up for it, MOL! Fevvers had a short life in our house too. 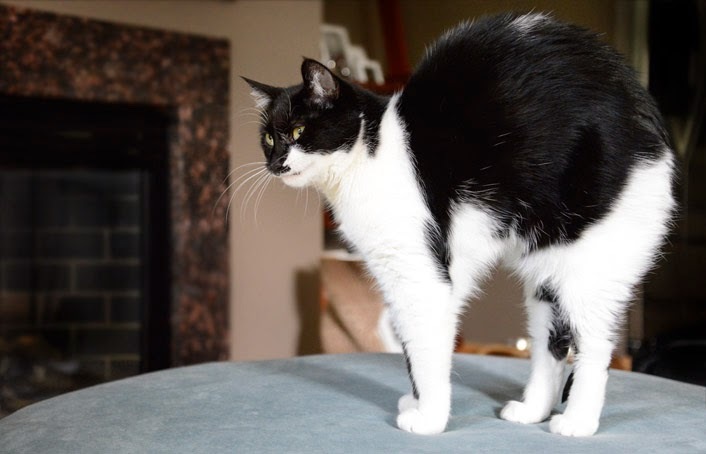 Practising your scardy cat pose Katie?